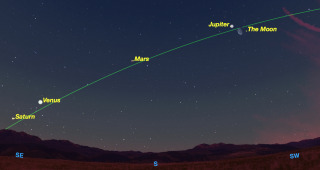 At dawn on Thursday, Dec. 31, the four brightest planets outline the ecliptic, the path followed by the sun and moon. The moon visits each in turn over the next week. Early risers this week will be treated to a spectacular display by the moon and the four brightest planets in the sky, in a fitting celestial welcome to the new year. Weather permitting, the planets Jupiter, Mars, Venus and Saturn will be visible stretching across the dawn sky right along the ecliptic (the invisible line that the sun follows across the sky). On New Year's Eve (Thursday, Dec. 31), the moon is slightly south of the ecliptic while Jupiter is slightly north of the ecliptic, so the moon passes 1.5 degrees below Jupiter. Three days later, on the morning of Sunday, Jan. 3, the moon is slightly above the ecliptic and passes 1.5 degrees north of Mars, which is also north of the ecliptic. Three days after that, on the morning of Wednesday, Jan. 6, the shrinking crescent moon is approaching Venus and Saturn. A day later, and it has passed them, but still forms a very close grouping with the two planets. On the morning of Jan. 9, Venus and Saturn will be particularly close, and will fit within the field of a small telescope. Because the solstice has only just passed, in the Northern Hemisphere dawn still comes quite late in the morning, so many people will be up and about while the sky is still dark enough to observe these interesting conjunctions between the moon and these four planets. This will be a good way to ring in the new year, which will be filled with many interesting events for skywatchers. Good planet hunting and Happy New Year! Editor's note: If you snap an awesome photo of the planets, or any other night sky view, and you'd like to share it with us and our news partners, send images and comments in to managing editor Tariq Malik at: spacephotos@space.com.